Today we had out Mike McLeod’s group of friends from North and South Carolina. 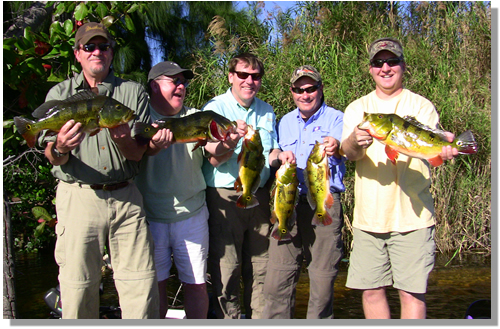 Mike and his friends are a group of 8 or 9 that love the outdoors, fishing and hunting. They stayed up by the Lake Okeechobee area so they would be convenient to duck and hog hunting as well as the fishing. Freshwater Tarpon on 10lb Mono! started planning a few more trips, including a peacock bass trip and Everglades fishing trip. The plan was, each day a different group of guys would fish a different location. So, we started with fishing for peacock bass in the Miami area at a hidden little lake, as we call it “the honey hole.” As most of the customers look when we go to Miami. A little unsure of what to expect, so they all just went with the flow. We explained that the water temp needed to raise a bit as the sunrises over head, we tried to ensure them that the peacock bass would bite slow at first and slowly get better. With that look on there faces, like I told them “you should have been here yesterday.” We explained that this time of the year the peacock bass group up and that once we found one we would then fine, two, three and so on. Lone behold that’s almost exactly how it happen, with two boats out today we had a lot of lines in the water. Our boat was the first to yell “fish on,” I heard it come from the rear of the boat and before I could look back we had one on up front a double. Lone behold the group of fish we were looking for, I quickly spin the boat around and proceeded to catch one after another. We called the other boat over to get into the action, they started catching a few also. These fish were not schooling fish, but good size 3, 4 and 5lb peacock bass. We decided to move off these fish for a moment and let them rest, and started to troll some live bait, that’s when the big bite happen. From the center of the boat, straight to the back, out to the open water and up for everyone to see a 15lb Tarpon. 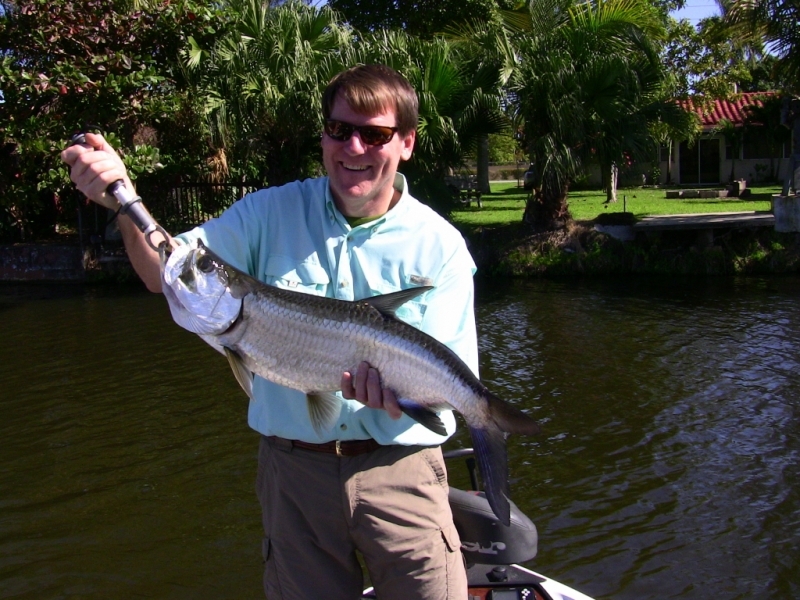 Yes, I did say, tarpon! We ended up fighting this fish for around 20 minutes, a great job of fighting this fish done by all. With, 20lb braid and a 10lb Mono leader I never thought this would happen. But as you can see by the picture it was awesome! We ended up moving around throughout the day, catching several fish in the 5lb range. We ended the day with a flurry and great pictures and about 50 peacock bass between us. The boys are back tomorrow for adventure in the Everglades! What great bunch of guys, old college buddies and really good friends! I hope to see the guys again in the near future. BassOnline.com is Florida Fishing largest Freshwater Guide Service, specializing in Florida bass fishing in the Florida lakes, canals and rivers for largemouth and peacock bass.